The firm run by three successive generations of Jacob Tonsons is best remembered today as one of the most important literary publishers in London in the late 17th and early 18th centuries. But its business as a stationer was just as important to the firm’s financial success, and the political connections of Jacob Tonson the Elder, one of the founders of the Whiggish Kit-Cat Club put it in a prime position to win the contract to supply the most important customer of all–the British government. 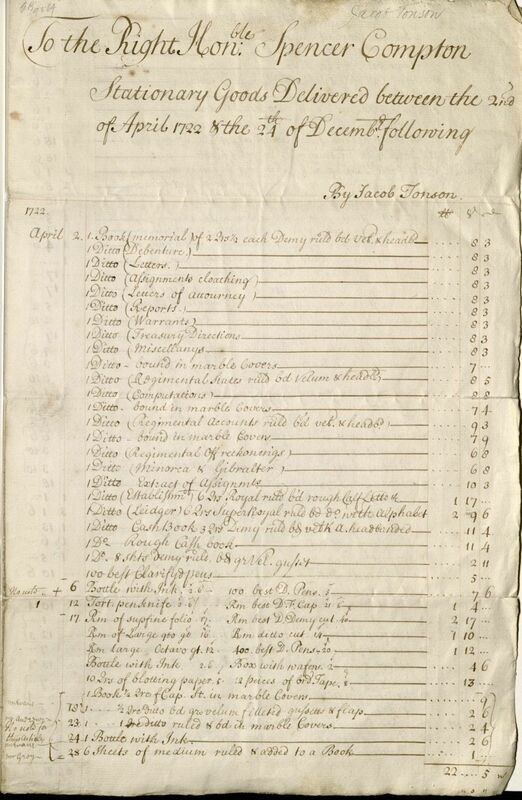 A new manuscript acquisition documents in detail the workings of the arrangement in the form of an itemized bill covering most of 1722, including nearly £100 worth of paper, pens, ink, and the like.